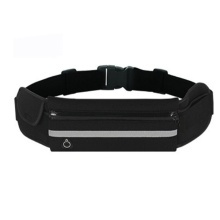 This waist bag is specially designed for outdoor activity lovers. The main compartment is roomy enough for holding your cellphone, sunglasses and credit card. The reflective strip warn other people to keep distance when you are running at night. It’s the best choice for outdoor sports enthusiasts! Made of smooth and waterproof diving fabric, comfortable to touch, lightweight and won’t burden you. Spacious zipped bum bag for storing your cellphone, keys, sunglasses, money , credit cards and so on. Adjustable waist band fit different waistlines, not easy to slip. Coated with reflective strip in the front of the pouch, ensures your safety at night. Suitable for outdoor sports like running, jogging, mountaineering, cycling, hiking and etc.